Ronald Johansen, 22, was rescued Friday night after rough seas swamped his skiff on a solo trip home from camping in Chagvan Bay. Pictured here on an earlier trip, Ronald Johansen, 22, of Goodnews Bay, swamped in rough seas on a trip back from Chagvan Bay last Friday. He clung to firewood and radioed for help, and was rescued after what he believes was more than an hour in the dangerously cold water. 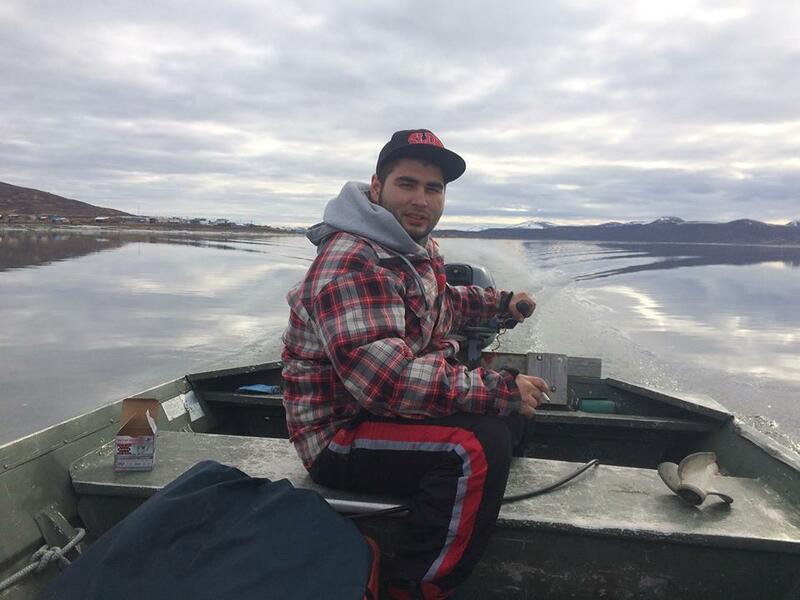 KDLG: Ronald Johansen, 22, was out camping with his brother and cousin in Chagvan Bay last week. After bagging some geese, Johansen set out alone by skiff Friday afternoon to return home to Goodnews Bay. The other two were to follow in a separate boat later. Johansen's trip should’ve taken an hour and half, and the waters outside the sand bars were calm as he set out. Those conditions, he said in a KDLG interview Tuesday, changed quickly. “Out of nowhere the west wind hit the outgoing tide and it started making swells out there. These were eight to 10 foot swells,” he recalled. Johansen battled the chop in his 14' skiff. “I was going straight up and down on the back side of the wave, and by the time I got to the bottom there was another bigger wave that hit the bow of the boat," he said. "It shot me straight underwater, and then the boat shot back out the water, and I was still holding on." Johansen was wearing a life jacket, but aware of what was coming, he wanted more floatation. In the skiff he had bundles of firewood collected from the trip. He says he grabbed one, threw it overboard, and went in after it. “I looked back and another wave hit the skiff and it did a barrel roll," he said. "I jumped off just in time." He was alone in the water, no one knew where he was, and passersby were unlikely. As he started to drift out further towards open ocean, Johansen used his emergency radio to call for help. The minutes ticked by. “Twenty minutes of being in the water my legs went numb. Thirty minutes and my arms went numb. I tied myself to the log and told myself 'if I die, I am going to die tied to this log so they can find me.'" He recalled a moment of panic as he decided to swim away from his makeshift raft. Thoughts of family sent him back to the safety of the logs. The firewood wasn't his only company in the open water of the Bering Sea. “I was six feet away from a school of sea lions who were just watching me the whole time. They were just grunting around and watching me,” he said. His radio calls were being received, but that didn’t mean a rescue was guaranteed. Back in the village, those who could hear his distress calls notified other boats, the Coast Guard, and airlines. Phone calls, text messages, and VHF traffic were flying out of Goodnews Bay Friday evening, frantically seeking some help. The Coast Guard says one Good Samaritan vessel made an effort towards Johansen's approximate location but was turned around by the rough conditions. It was getting late into the evening, and Johansen had no idea if a rescue was coming or not. He tried to make himself as visible as possible. “As soon as I got on top of a big swell, I would push myself up with a log to try and reach my hand as high as I could." Bethel-based Yute Air was among those notified of the situation. Yute's dispatch directed pilot Ernie Turentine to detour from his route back to Bethel, and instead he flew south along the open water towards Chagvan Bay. Turnentine recalled that the rough seas he saw below that evening. "There were some really big waves out there," he said in an interview Wednesday, adding that the conditions made it near impossible to discern objects on the sea surface. Scouring back and forth, he looking out one side and his one passenger out the other, Johansen's fortune turned when Turentine spotted his swamped skiff. By VHF, he relayed its location to Johansen's brother and cousin, who headed that way in their own boat. The tide was going out, so Turentine continued his search further seaward for the missing man clinging to a bundle of firewood. Turentine says he never saw Johansen, but given the swamped boat’s location, Johansen's brother and cousin soon did. Johansen was hauled out after what he thinks may have been an hour and a half in the cold, choppy Bering Sea. The three men made quick for nearby Platinum. “My wife and my kids are the only thing that made me hold on," he said. Later, after he was home and word of his tale spread, some elders told him the sea lions had been there to protect him. Johansen said he doesn't know if that’s true or not. But he does believe he is lucky to be alive this week. He also believes it’s a good idea to wear a life jacket. Johansen has received reports his boat has washed up on shore, and he plans to head out soon and recover it. Contact Matt Martin at (907)-842-2200 or matt@kdlg.org.